Today I am honored to have Edwin Najmi here with me. Edwin Najmi is a world champion and an amazing modern day competitor who I love to watch. 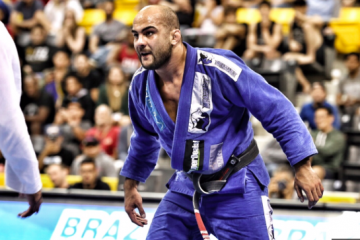 Edwin is a student of a friend of mine and someone I look up to in Jiu Jitsu, Romulo Barral. Edwin won the open class world at purple belt against Nicolas Meregali by flying triangle and he is one of the most exciting guys grappling today. I asked him if he could show us the D’arce choke that he is always doing so the video is below and then I will do some breakdown. So very high level details here guys. The first thing worth mentioning is how does not set up the D’arce right away. Edwin waits and goes for the guillotine as his opponent is trying to come up int the half guard. When he gets the guillotine or the head and arm control he uses this to flatten the opponent out and when they are flat he will get his legs out of the guard and do a front roll. Once he is out of the half guard Edwin will now begin to transfer from a guillotine choke into the darce choke that he is so good at. Once he is able to lock up his arms and get the darce choke deep he is going to pinch his elbows together as he squeezes. This is an important detail because it makes it a very good choke and not a crank. Super impressive position by Edwin and I am very happy to have him here on my YouTube channel. Oss guys, enjoy this position.